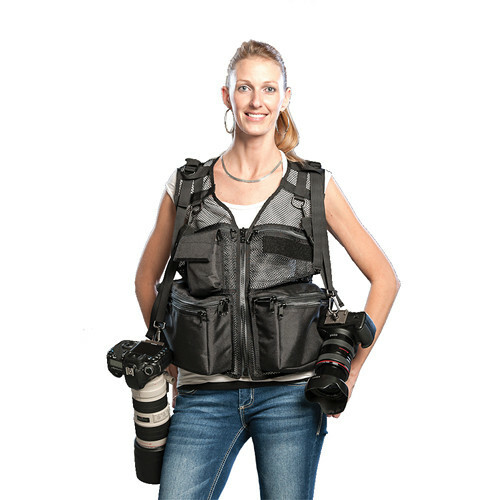 This large coyote Wedding Photographer Mesh Photo Vest from The Vest Guy features dual cargo pockets for your lenses, and a pair of top mesh zippered pockets and one fabric touch-fastened pocket for your accessories. Each cargo pocket features two padded, touch-fastened dividers, which can protect three standard lenses. The dividers can also be removed to accommodate a telephoto lens such as a 70-200mm or a 100-400mm. A detachable, adjustable camera vest strap at the front holds your DSLR with an additional attached lens. A rear touch-fastened pocket holds a 9.7" tablet at your back. The vest is made from a breathable mesh material and features a front zippered closure. A tripod can be attached to hang from your vest at the side adjustment straps at the base. There are two touch-fastened panels for attaching an optional touch-fastened nametag or logo, and front D-rings hold the camera vest strap allowing you to have your camera in a ready-to-shoot position. This vest is made in the USA. Box Dimensions (LxWxH) 12.4 x 5.8 x 5.5"